This article is about the Formula One World Champion. For his nephew, also a racing driver, see Juan Manuel Fangio II. This name uses Spanish naming customs: the first or paternal family name is Fangio and the second or maternal family name is Déramo. Juan Manuel Fangio Déramo (Spanish pronunciation: [ˈfanχjo], Italian pronunciation: [ˈfandʒo]; 24 June 1911 – 17 July 1995), nicknamed El Chueco ("the bowlegged one", also commonly translated as "bandy legged") or El Maestro ("The Master"), was an Argentine racing car driver. He dominated the first decade of Formula One racing, winning the World Drivers' Championship five times. He won the World Championship of Drivers five times—a record which stood for 47 years until beaten by Michael Schumacher—with four different teams (Alfa Romeo, Ferrari, Mercedes-Benz and Maserati), a feat that has not been repeated. He is regarded by many as one of the greatest F1 drivers of all time and holds the highest winning percentage in Formula One – 46.15% – winning 24 of 52 Formula One races he entered. Fangio is the only Argentine driver to have won the Argentine Grand Prix, having won it four times in his career—the most of any driver. Fangio's grandfather, Giuseppe Fangio, emigrated to Buenos Aires from Italy in 1887. Giuseppe managed to buy his own farm near Balcarce, a small city in southern Buenos Aires Province, Argentina, within three years by making charcoal from tree branches. His father, Loreto, emigrated to Argentina from the small central Italian town of Castiglione Messer Marino in the Chieti province of the Abruzzo region. His mother, Herminia Déramo, was from Tornareccio, slightly to the north. They married on 24 October 1903, and lived on farms where Herminia was a housekeeper and Loreto worked in the building trade, becoming an apprentice stonemason. Fangio was born in Balcarce on San Juan's Day 1911 at 12:10 am. His birth certificate was mistakenly dated 23 June by the Register of Balcarce. He was the fourth of six children. In his childhood he became known as El Chueco, the bandy legged one, for his skill in bending his left leg around the ball to shoot on goal during football games. Fangio started his education at the School No. 4 of Balcarce, Calle 13 before transferring to School No. 1 and 18 Uriburu Av. When Fangio was 13, he dropped out of school and worked as an assistant mechanic. When he was 16, he started riding as a mechanic for his employer's customers. He developed pneumonia, which almost proved fatal, after a football game where hard running had caused a sharp pain in his chest. He was bed-ridden for two months, cared for by his mother. After recovering, Fangio served compulsory military service at the age of 21. In 1932 he was enlisted at the Campo de Mayo cadet school near Buenos Aires. His driving skills caught the attention of his commanding officer, who appointed Fangio as his official driver. Fangio was discharged before his 22nd birthday after taking his final physical examination. He returned to Balcarce where he aimed to further his football career. Along with his friend José Duffard he received offers to play at a club based in Mar del Plata. Their teammates at Balcarce suggested the two work on Fangio's hobby of building his own car and his parents donated space in a small section of their home where a rudimentary shed was built. After finishing his military service, Fangio opened his own garage and raced in local events. He began his racing career in Argentina in 1934, driving a 1929 Ford Model A, which he had rebuilt. These local events were unlike anything in Europe or North America, they were long-distance races held on mostly dirt roads up and down South America. During his time racing in Argentina, he drove Chevrolet cars and was Argentine National Champion in 1940 and 1941. One particular race, which he won in 1940, the Gran Premio del Norte, was almost 10,000 km long. This race started in Buenos Aires and ran up through the Andes to Lima, Peru and back again, taking nearly two weeks with stages held each day. Following many successes driving mainly modified American stock cars; he was funded by the Argentine Automobile Club and the Argentine government and sent to Europe in 1948 to continue his career. In the Tourism Highway category, Fangio participated in his first race between 18 and 30 October 1938 as the co-pilot of Luis Finocchietti. Despite not winning the Argentine Road Grand Prix, Fangio drove most of the way and qualified in seventh place. In November of that year, he entered the "400 km of Tres Arroyos ", but it was suspended due to a fatal accident. In 1939, the circuit was in Forest, which conformed well with his last involvement with a Ford V8. With Hector Tieri as his partner, they led Turismo Carretera that year with a Chevrolet, competing for the Argentine Grand Prix. Suspended by a strong rain and resumed in Cordoba, he managed their first stage victory, winning the fourth stage from Catamarca to San Juan. In October, after 9500 km of competition in Argentina, Bolivia and Peru, he won his first race in Turismo Carretera, the Grand Prix International North. He became the first TC Argentine Champion to have driven a Chevrolet. In 1941, he beat Oscar Gálvez in the Grand Prix Getúlio Vargas in Brazil. 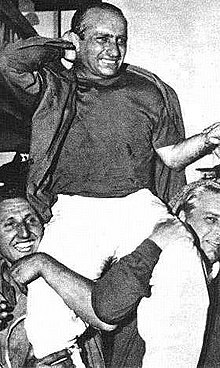 For the second time, Fangio was crowned champion of Argentine TC. In 1942, he ended South Grand Prix in tenth place in accordance with the general classification. In April he won the race "Mar y Sierras" and had to suspend the mechanical activity due to the start of World War II. In 1946, after a brief period of inactivity, Fangio returned to racing with two races in Morón and Tandil driving a Ford T. In February 1947, Fangio competed at National Mechanics (MN) in the circuit Retirement, and on 1 March, he started the race for Rosario City Award. Subsequently, Fangio triumphed in the circuit 'Double Back Window' Race. Fangio driving a Maserati 250F. Fangio, unlike later Formula One drivers, started his racing career at a mature age and was the oldest driver in many of his races. During his career, drivers raced with almost no protective equipment on circuits with no safety features, F1 cars back in the 1950s were very rapid, extremely demanding, physically, to drive, races were much longer and demanded incredible physical stamina. Tyres were cross-ply, and far less forgiving: treads stripping in a race was a common occurrence; as was spark plug fouling. It must be remembered, there were no electronic aids or computer intervention. Fangio's ability to focus 100% for the whole race and his precision with car placement on the circuit were legendary. At the end of a GP, drivers often suffered blistered hands, caused by heavy steering and gear changing. Considering Fangio's age, when he started F1 (over 40) he was clearly one of the top GP drivers, ever; rivalling Tazio Nuvolari. Fangio had no compunction about leaving a team, even after a successful year or even during a season, if he thought he would have a better chance with a better car. As was then common, several of his race results were shared with teammates after he took over their car during races when his own had technical problems. His rivals included Alberto Ascari, Giuseppe Farina and Stirling Moss. Throughout his career, Fangio was backed by funding from the Argentine government of Juan Perón. Fangio after winning the 1957 German Grand Prix at the Nürburgring. Fangio's first entry into Grand Prix racing came in the Grand Prix de l'ACF at Reims, where he started his Simca Gordini from 11th on the grid but retired. 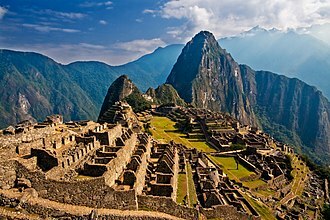 Back to South America, during a long-distance race, he went off the road in Peru and tumbled down a mountainside. His co-driver, Daniel Urrutia was thrown out of the car, and when Fangio found him, he was dying. Following Urrutia's death, he considered quitting the sport. But he resolved to carry on and returned to Europe the following year, and raced in Sanremo, but having upgraded to a Maserati 4CLT/48 sponsored by the Automobile Club of Argentina he dominated the event, winning both heats to take the aggregate win by almost a minute over Prince Bira. Fangio entered a further six Grand Prix races in 1949, winning four of them against top-level opposition. For the first World Championship of Drivers in 1950, Fangio was taken on by the Alfa Romeo team alongside Farina and Luigi Fagioli. With competitive racing machinery following the Second World War still in short supply, the pre-war Alfettas proved dominant. Fangio won each of the three races he finished at Monaco, Spa and Reims-Gueux but Farina's three wins at races Fangio retired from and a fourth place allowed Farina to take the title, even though Fangio was quicker than Farina, who was able to take advantage of Fangio's mechanical woes. Fangio's most notable victory that year was at Monaco, where he dodged a multi-car pile-up and easily won the race. In 1950s non-championship races Fangio took a further four wins at San Remo, Pau and the fearsome Coppa Acerbo at the 16 mile Pescara public road circuit, and two seconds from eight starts. He also won a handful of races for the Argentine Automobile Club driving a Maserati 4CLT and a Ferrari 166. With the 1952 World Championship being run to Formula Two specifications, Alfa Romeo did not have a car for the new formula and were unable to use their supercharged Alfettas, so they withdrew. As a result, the defending champion found himself without a car for the first race of the championship and remained absent from F1 until June, when he drove the British BRM V16 in non-championship F1 races at the public road circuits at Albi in France and Dundrod in Northern Ireland. Fangio had agreed to drive for Maserati in a non-championship race at Monza the day after the Dundrod race, but having missed a connecting flight he decided to drive through the night from Lyon, arriving half an hour before the start having to drive on mountain roads through the Alps, before the existence of motorways. Arriving at Monza at 2 p.m., he was badly fatigued and with the race starting at 2:30 p.m., Fangio started the race from the back of the grid but lost control on the second lap, crashed into a grass bank, and was thrown out of the car as it flipped end over end. He was taken to a hospital in Milan with multiple injuries, the most serious being a broken neck, and spent the rest of 1952 recovering in Argentina. Nino Farina, who had won the race visited Fangio in hospital and gifted him with the winner's laurel wreath. It was seen as a humbling gesture from Farina, who was born into wealth and aristocracy as opposed to Fangio, who had much humbler and working-class origins. In Europe, and back to full racing fitness in 1953, Fangio rejoined Maserati for the championship season, and against the dominant Ferraris led by Ascari he took a lucky win at Monza. Fangio's car had a bad vibration all throughout practice, and he offered the Maserati mechanics 10% of his winnings if they fixed the vibration. He qualified second with Felice Bonetto seventh (whose car also had a bad vibration), and Fangio's mechanics had taken care of the vibration on his car, and Fangio was able to set fastest lap on his way to a 1.4-second victory over Nino Farina while Bonetto ran out of fuel, and the vibration on Bonetto's car had not disappeared- according to Fangio, Bonetto's teeth had "fallen out". Along with that win, Fangio secured three second places to finish second in the Championship, and also came third first time out in the Targa Florio. He also competed and won one of 2 heats in the Albi Grand Prix, again with BRM and driving the fearsome and powerful Type 15, a car with a 600 hp supercharged V16 that was difficult to drive. He also competed in one of the most dangerous and prestigious races in Europe: the Mille Miglia, a 1000 mile race on open public roads covering nearly all of northern Italy driving an Alfa Romeo 6C 3000 CM entered by the factory themselves. The Alfa team was expected to win, and after Farina, Karl Kling and Consalvo Sanesi all crashed Fangio was leading when he reached Rome, pushing very hard from when he started in Brescia. Fangio then suffered left front steering arm failure near Bologna and only had consistent steering on the right front; this allowed Mille Miglia expert Giannino Marzotto to catch and beat Fangio by 12 minutes, even though the Argentine driver drove hard to keep up with Marzotto. He ended 1953 by winning the dauntingly dangerous and difficult 2,000 mi (3,200 km) Carrera Panamericana in Mexico driving a Lancia D24; Fangio was able to win this 5-day open public road rally that started at the Mexico-Guatemala border and ended at the Mexico-United States border in record time- about 18 and a half hours total driving time. The race however was marred by 50-year old Bonetto's death on the third day of the competition in the town of Silao, whom like Fangio was also driving a works Lancia. In 1954 Fangio raced for Maserati until Mercedes-Benz entered competition in mid-season. He won his home Grand Prix in Buenos Aires and at Spa with the iconic 250F. Mercedes-Benz's first race was the French Grand Prix at the fast, straight dominated Reims public road circuit, and he won the race with the streamlined, closed-wheel W196 Monoposto- battling with teammate Karl Kling. Fangio failed to win at Silverstone, with the closed-wheel car designed for straight-line speed struggling at the high speed corner-dominated circuit. Fangio got the more nimble open-wheeled W196 for the Nürburgring, and he promptly won the race, as he did at Bremgarten and then at Monza, the latter with the streamlined car. Monza was a particularly brutal race in that Alberto Ascari had turned up with the new Lancia, and young British up-and-comer Stirling Moss in a private Maserati was also competitive during the race. 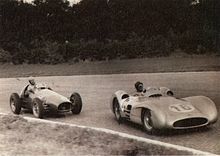 Ascari and Moss both passed Fangio and raced each other hard until Ascari dropped out with engine problems. Moss's engine blew up near the end of the race and Fangio took victory. Winning eight out of twelve races (six out of eight in the championship) and winning his second championship in that year, he continued to race with Mercedes—driving a modified W196 in 1955 in a team that included Moss. For 1955, Fangio subjected himself to a training programme which was strenuous in an effort to keep up his fitness levels high which was comparable to his younger rivals. He won a particularly brutal race at the Gran Premio de la Republica Argentina. This race was run in Buenos Aires during a gruelling 40°C (104°F) heat wave, and with track temperature of over 135 °F (57 °C), few drivers other than Fangio were able to complete the race. The W196's chassis had heated up and Fangio's right leg rubbed against the chassis structure, and even after receiving severe burns, he kept going. It took Fangio 3 months to recover from his injuries. 1955 also saw Fangio attempt the Mille Miglia again (this time without a navigator), driving a Mercedes-Benz 300 SLR. After leaving at 6:58 a.m., the car's advanced engine began developing problems when he got to Pescara. The Mercedes mechanics found nothing, and sent him off. Fangio was losing time to Moss and Hans Herrmann, and when he got to Rome the engine was still not running smoothly. Again Fangio was sent away by the mechanics. And when he got to Florence, a few loud bangs were heard, so the mechanics raised the bonnet and they found that one of the fuel injection pipes had broken, so Fangio’s 300 SLR was running on 7 cylinders instead of 8; this could not be repaired and Fangio drove all the way back to Brescia with a misfiring engine, finishing in 2nd behind Moss. Fangio surmised later that Mercedes felt he could not win the race without a navigator so they did not put as much effort behind preparing his car as they did with Moss's car, who had a navigator. At the end of the second successful season (which was overshadowed by the 1955 Le Mans disaster in which more than 80 spectators were killed, an accident which happened right in front of and nearly killed him) Mercedes withdrew from racing and after four attempts, Fangio would never race at Le Mans again. 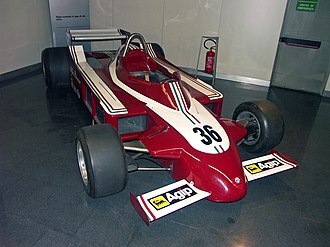 A number of races were cancelled after this race except for Britain and Italy (which both already had circuits with new and updated safety facilities), which he finished in 2nd in the former and won the latter, allowing him to win his 3rd world championship. In 1956 Fangio moved to Ferrari to win his fourth title. Enzo Ferrari and Fangio did not have a very warm relationship, despite their shared success with the Lancia-Ferrari car that was difficult to drive. Fangio took over his teammate's cars after he suffered mechanical problems in three races, the Argentine, Monaco and Italian Grands Prix. In each case the points were shared between the two drivers. At the season-ending Italian Grand Prix, Fangio's Ferrari teammate Peter Collins, who was in a position to win the World Championship with just 15 laps to go, handed over his car to Fangio. They shared the six points won for second place, giving Fangio the World title. "I have never driven that quickly before in my life and I don't think I will ever be able to do it again." 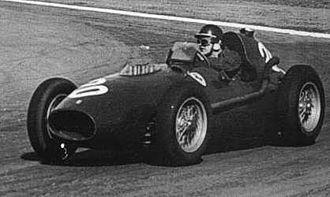 In 1957 Fangio returned to Maserati, who were still using the same iconic 250F which Fangio had driven at the start of 1954. Fangio started the season with a hat-trick of wins in Argentina, Monaco and France, before retiring with engine problems in Britain. He also won the 12 Hours of Sebring sportscar race in America driving a Maserati 450S with Jean Behra for the second year running. But at the Grand Prix after Britain, the German Grand Prix at the Nürburgring circuit, Fangio needed to extend his lead by six points to claim the title with two races to spare. From pole position Fangio dropped to third behind the Ferraris of Mike Hawthorn and Collins but managed to get past both by the end of the third lap. Fangio had started with half-full tanks since he expected that he would need new tyres halfway through the race. In the event Fangio pitted on lap 13 with a 30-second lead, but a disastrous stop left him back in third place and 50 seconds behind Collins and Hawthorn. Fangio came into his own, setting one fastest lap after another, culminating in a record-breaking time on lap 20 a full eleven seconds faster than the best the Ferraris could do. On the penultimate lap Fangio got back past both Collins and Hawthorn, and held on to take the win by just over three seconds. 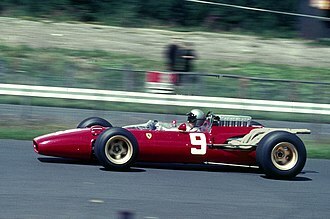 With Musso finishing down in fourth place, Fangio claimed his fifth title. This performance is often regarded as the greatest drive in Formula One history, and it was to be Fangio's last win. After his series of consecutive championships he retired in 1958, following the French Grand Prix. Such was the respect for Fangio, that during that final race, race leader Hawthorn had lapped Fangio and as Hawthorn was about to cross the line, he braked and allowed Fangio through so he could complete the 50-lap distance in his final race. He would cross the line over two minutes down on Hawthorn. Getting out of the Maserati after the race, he said to his mechanic simply, "It is finished." He was famous for winning races at what he described as the slowest possible speed, in order to conserve the car to the finish. Cars in the 1940's and 1950's were unpredictable in their reliability, with almost any component susceptible to breaking. He won 24 World Championship (22 outright and 2 shared with other drivers) Grands Prix from 52 entries – a winning percentage of 46.15%, the best in the sport's history (Alberto Ascari, who is second best, holds a winning percentage of 40.63%). It should be noted however that both drivers were already experienced grand prix drivers before the world championship started. The Batista Dictatorship of Cuba established the non-Formula One Cuban Grand Prix in 1957. Fangio won the 1957 event, and had set fastest times during practice for the 1958 race. On 23 February 1958, two unmasked gunmen of Fidel Castro's 26th of July Movement entered the Hotel Lincoln in Havana and kidnapped Fangio at gunpoint. The motive was simple: By capturing the biggest name in motorsport the rebels were showing up the government and attracting worldwide publicity to their cause. But despite the shocking news spreading across the globe, President Batista would not be outdone and ordered the race to continue as usual while a crack team of police hunted down the kidnappers. They set up roadblocks at intersections, and guards were assigned to private and commercial airports and to all competing drivers. Fangio was taken to three separate houses. His captors allowed him to listen to the race via radio, bringing a television for him to witness reports of a disastrous crash after the race concluded. In the third house, Fangio was allowed his own bedroom but became convinced that a guard was standing outside of the bedroom door at all hours. The captors talked about their revolutionary programme which Fangio had not wished to speak about as he did not have an interest in politics. He later expressed sympathy for his captors: "Well, this is one more adventure. If what the rebels did was in a good cause, then I, as an Argentine, accept it." Fangio was released after 29 hours and he remained a good friend of his captors afterwards. The captors motives were to force the cancellation of the race in an attempt to embarrass the Batista regime. After Fangio was handed over to the Argentine embassy soon after the race, many Cubans were convinced that Batista was losing his power because he failed to track the captors down. The Cuban Revolution concluded in January 1959, cancelling the 1959 Cuban Grand Prix. The Fangio kidnapping was dramatized in a 1999 Argentine film directed by Alberto Lecchi, Operación Fangio. When Fangio attended the 1958 Indianapolis 500, he was offered $20,000 to qualify in a Kurtis-Offenhauser by the car's owner, George Walther, Jr (father of future Indy 500 driver Salt Walther). Fangio had previously attended the 500 in 1948 at which time he expressed his interest in competing the race. However, he was unable to qualify. Walther allowed Fangio to stand aside (before a contract with British Petroleum came to light), still he did not want another driver to take over Fangio's position. 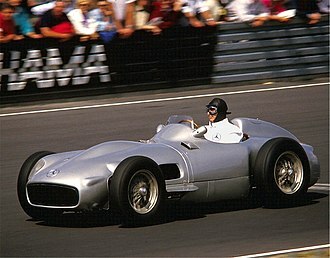 During the rest of his life after retiring from racing Fangio sold Mercedes-Benz cars, often driving his former racing cars in demonstration laps. Even before he joined the Mercedes Formula One team, in the mid-1950s, Fangio had acquired the Argentine Mercedes concession. He was appointed President of Mercedes-Benz Argentina in 1974, and its Honorary President for Life in 1987. Fangio was also the flagman for the 1975 Winston 500 (NASCAR race), and was the flagman for the Argentine Grand Prix when it was run from 1972 to 1981. Fangio was the special guest of the 50th anniversary 1978 Australian Grand Prix at the Sandown Raceway in Melbourne (7 years before the Australian Grand Prix became a round of the World Championship in 1985). After awarding the Lex Davison Trophy to race winner Graham McRae (who stated that meeting Fangio was a bigger thrill than actually winning the race for the 3rd time), the legendary Argentinian drove his 1954 and 1955 World Championship-winning Mercedes-Benz W196 in a spirited 3 lap exhibition against 3 other cars, including the 1966 World Championship winning Brabham BT19 driven by Australia's own triple World Champion Jack Brabham. Despite his car having been given away over 10 years previously to the Repco Brabham, Fangio pushed the Australian all the way to the flag. Before the "race", Fangio (who at 67 years of age and not having raced competitively in 20 years, still held a full FIA Super Licence) had stated his intention of racing and not just putting in a demonstration drive. At the beginning of the 1980s Fangio underwent successful bypass surgery to correct a heart condition. He had also been suffering from kidney failure for some time before his death. In 1980 Konex Foundation granted him the Diamond Konex Award as the best Sportsman of the decade in Argentina. Following his retirement, Fangio was active in assembling automotive memorabilia associated with his racing career. This led to the creation of the Museo Juan Manuel Fangio, which opened in Balcarce in 1986. Fangio was inducted into the International Motorsports Hall of Fame in 1990. He returned to the spotlight in 1994, when he publicly opposed a new Province of Buenos Aires law denying driving licences to those over 80 (which included Fangio). Denied a renewal of his card, Fangio reportedly challenged Traffic Bureau personnel to a race between Buenos Aires and seaside Mar del Plata (a 400 km (250 mi) distance) in two hours or less, following which an exception was made for the five-time champion. In 1990, Fangio met the three-time world champion, Ayrton Senna, who had genuinely felt the encounter had reflected the mutual affection for both drivers. Juan Manuel Fangio died in Buenos Aires in 1995, at the age of 84 from kidney failure and pneumonia; he was buried in his home town of Balcarce. His pallbearers were his younger brother Ruben Renato ("Toto"), Moss, compatriot racers José Froilán González and Carlos Reutemann, Jackie Stewart and the president of Mercedes-Benz Argentina at the time. In the early 1950s, Fangio was involved in a road accident when he was forced to swerve to avoid an oncoming truck. The car, a Lancia Aurelia GT clipped a pole, spinning twice and threw Fangio out, which led him to sustain grazed elbows. One passenger stated the incident was the first time Fangio had been so terrified since the Korean War. 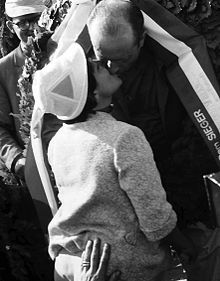 Fangio was never married, but was involved in a romantic relationship with Andrea Berruet whom he broke up with in 1960. They had a son named Oscar Cacho Espinosa who was acknowledged as the unrecognised son of Fangio in 2000. In July 2015, an Argentinian court ruling ordered exhumation of Fangio's body after Espinosa's claims to be the unacknowledged son of the former race car driver. In December 2015, the Court confirmed that Espinosa was indeed Fangio's son. In February 2016, it was confirmed that Rubén Vázquez is Fangio's son. His nephew, Juan Manuel Fangio II, is also a successful racing driver. The Formula1.com website states of Fangio: "Many consider him to be the greatest driver of all time." 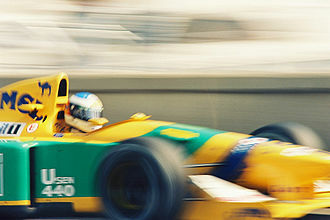 Several highly successful later drivers, such as Jim Clark, Alain Prost, Ayrton Senna and Michael Schumacher, have been compared with Fangio, however the qualities required for success, levels of competition, and racing rules have changed over time. 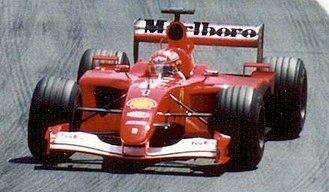 His record of five World Championship titles stood for 45 years before German driver Michael Schumacher surpassed it in 2003. Schumacher said, "Fangio is on a level much higher than I see myself. What he did stands alone and what we have achieved is also unique. I have such respect for what he achieved. You can't take a personality like Fangio and compare him with what has happened today. There is not even the slightest comparison." When Lewis Hamilton equaled Fangio's five titles in 2018 he praised Fangio calling him the "Godfather of our sport"
In his home country of Argentina, Fangio is revered as one of the greatest sportsmen the nation has ever produced. Argentines often refer to him as El Maestro, el mejor, which translates into The Master, the best one. "What he did in his time is something that was an example of professionalism, of courage, of style and as a man, a human being. Every year there is a winner of the championship, but not necessarily a world champion. I think Fangio is the example of a true world champion"
The first Michel Vaillant story was partly based on an imaginary conflict stirred up by fictional newspaper The New Indian on Fangio winning the World Championship at the Indy 500. Six statues of Fangio, sculpted by Catalan artist Joaquim Ros Sabaté, stand at race venues around the world: Puerto Madero, Buenos Aires; Monte Carlo, Monaco; Montmeló, Spain; Nürburgring, Germany; Stuttgart-Untertürkheim, Germany; and Monza, Italy. The Museo Juan Manuel Fangio was established in Balcarce (Fangio's birthplace) in 1986. Argentina's largest oil company, Repsol YPF, launched the "Fangio XXI" gas brand. The Zonda 2005 C12 F was originally intended to be named "Fangio F1," but was changed out of respect after his death. Maserati created a special website in 2007 to commemorate the 50th anniversary of his fifth and final world championship triumph. A Mercedes-Benz W196R Formula 1 race car, driven by Fangio in his World Championship-qualifying Grand Prix races in 1954 and 1955 was sold for a record $30 million at an auction in England on 12 July 2013. † Car ran with streamlined, full-width bodywork. ^ "Juan Manuel FANGIO". www.statsf1.com. Retrieved 31 October 2018. ^ a b Donaldson, Gerald. "Juan Manuel Fangio". Formula1.com. Retrieved 2018-05-28. Many consider him to be the greatest driver of all time. ^ "Revealed: The best F1 driver of all time according to SCIENCE". dailymail.co.uk. Retrieved 8 December 2017. ^ "Statistics Drivers - Wins - By number". www.statsf1.com. Retrieved 31 October 2018. ^ "Statistics Drivers - Wins - By national GP". www.statsf1.com. Retrieved 31 October 2018. ^ "Grands Prix Argentina". www.statsf1.com. Retrieved 31 October 2018. ^ Donaldson 2003, p. 7-8. ^ "F1 Fanatics: Juan Manuel Fangio". F1fanatics.wordpress.com. 31 January 2011. Retrieved 20 March 2011. ^ a b "Biography of Juan Manuel Fangio (Part One 1911–1936)" (in Spanish). Museo Fangio. Retrieved 23 August 2012. ^ a b c Tremayne, David (18 July 1995). 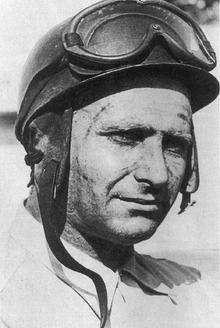 "Obituaries: Juan Manuel Fangio". The Independent. ^ "Juan Manuel Fangio – Developed Childhood Interest In Cars". jrank.org. Retrieved 3 August 2012. ^ "Juan Manuel Fangio – Pieced Together Own Race Car". jrank.org. Retrieved 3 August 2012. ^ a b Donaldson 2003, p. 14-15. ^ Rendall, Ivan (1995) . The Chequered Flag: 100 years of motor racing. Weidenfeld & Nicolson. p. 166. ISBN 0-297-83550-5. ^ a b c d e f g h "Juan-Manuel Fangio – Biography". 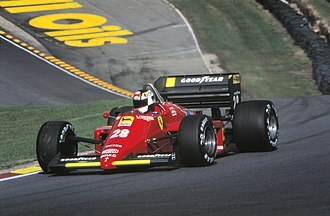 grandprixhistory.org. ^ a b "Part Two (1937–1942)". Argentina: Foundation Fangio. Retrieved 15 February 2011. ^ Sabaris, Gerardo (2010). "Un tributo al chueco ... Biografica". Argentina: jmfangio.org. Retrieved 15 February 2011. ^ "Part Three (1943–1949)". Argentina: Foundation Fangio. Retrieved 15 February 2011. ^ a b c d "Juan Manuel Fangio". ESPN UK. ^ a b c d e f "Juan-Manuel Fangio Profile - Drivers - GP Encyclopedia - F1 History on Grandprix.com". grandprix.com. ^ Jones, Hill 1995, p. 16. ^ "Lancia Wins Big Road Race". Townsville Daily Bulletin. Townsville Daily Bulletin. Retrieved 13 April 2013. ^ "MASERATI AND FANGIO F1 WORLD CHAMPIONS IN 1957". www.greatcarstv.com. Archived from the original on 4 December 2008. Retrieved 23 January 2009. ^ Edsall, Larry. "Maserati celebrates 60th anniversary of Eldorado racer". The Classic Cars Journal. Retrieved 6 November 2018. ^ "Cuba Rebels Kidnap Champ Race Driver". The Milwaukee Sentinel. 24 February 1958. p. 1. ^ "Cuban Rebels Kidnap Argentine Auto Racer". The Newburgh News. 24 February 1958. p. 1. ^ a b c "Kidnapped in Cuba". ESPN UK. ^ "Rebels let Fangio see crash on TV". The Bulletin. 26 February 1958. p. 2. ^ "Fangio Released by Rebels "Treated Very Well"". The Glasgow Herald. 26 February 1958. p. 7. ^ "Rebels Free Fangio; Foul Play is Cry in Tragic Cuban Auto Race". The Portsmouth Times. 25 February 1958. p. 1. ^ "Fangio Kidnapping Convinces Many Batista Powerless". The Free Lance-Star. 26 February 1958. p. 2. ^ "Operación Fangio" (in Spanish). Cine Nacional. Retrieved 20 March 2011. ^ Davidson, Shaffer 2006, p. 144. ^ edisjasarevic (13 October 2006). "Fangio vs Brabham, 1978". Retrieved 8 December 2017 – via YouTube. ^ "Juan Manuel Fangio". easybuenosairescity.com. Retrieved 4 August 2012. ^ "Op bezoek bij Juan Manuel Fangio: de mythe". Autovisie. 1991 nr 1: Page 44–51. 5 January 1991. ^ "''La Nación'': Cuándo los mayores no deben manejar" (in Spanish). Lanacion.com.ar. Retrieved 20 March 2011. ^ "Biography of Juan Manuel Fangio (1985–1995 Part Six)" (in Spanish). Museo Fangio. Retrieved 23 August 2012. ^ Donaldson, Gerald (2003). Fangio: The Life Behind the Legend. London: Virgin Books. p. 304. ISBN 978-0-7535-1827-4. ^ "Fangio gives Sandown crowd a treat". The Age. 13 September 1978. p. 54. ^ «Un hijo no reconocido de Fangio vive en Cañuelas» InfoCañuelas, 17 de noviembre de 2009. Consultado el 19 de febrero de 2011. ^ Confirman que "Cacho" Espinosa es hijo de Fangio – Clarín (in Spanish). ^ Confirmaron que Rubén Vázquez es hijo de Fangio – Cuatro Cuatro Dos (in Spanish). ^ "DRIVERS: JUAN-MANUEL FANGIO". www.grandprix.com. Retrieved 23 January 2009. ^ "Schumi: Fangio was greater than me". London: BBC. 12 October 2003. Retrieved 29 September 2006. ^ "Champion Schumacher Rejects Comparisons To Fangio". usgpindy.com. Archived from the original on 27 November 2003. Retrieved 29 September 2006. ^ Association, Press (2018-10-18). "Lewis Hamilton hails Formula One 'Godfather' Juan Manuel Fangio". the Guardian. Retrieved 31 October 2018. ^ "Juan Manuel Fangio". f1-grandprix.com. Retrieved 22 September 2006. ^ "Discovery Channel – Guide Car". discoverychannelasia.com. Archived from the original on 13 May 2006. Retrieved 22 September 2006. ^ "Formula 1's greatest drivers. Number 2: Juan Manuel Fangio". BBC Sport. ^ "Maserati commemorates Fangio anniversary". F1Fanatic.co.uk. Retrieved 9 August 2007. ^ "Mercedes sells at auction for record $30 million". Money. 12 July 2013. ^ a b c d e f g "Carreras Año 1949 – Museo Fangio". museofangio.com. ^ "1949 Grand Prix du Rousillon". silhouet.com. ^ "Formula 2 1949 – Monza". formula2.net. ^ a b c "South American Formula Libre/Temporada Races 1946–1952". teamdan.com. ^ Allen Brown. "Circuit d'Albi, 10 Jul 1949 « Non-Championship F1 « OldRacingCars.com". oldracingcars.com. ^ "Un tributo al chueco... Pau, 1950". jmfangio.org. ^ Allen Brown. "Autodromo di Ospedaletti, 16 Apr 1950 « Non-Championship F1 « OldRacingCars.com". oldracingcars.com. ^ "Results 1950 Formula 1 Grand Prix of Monaco". F1 Fansite. Retrieved 6 September 2017. 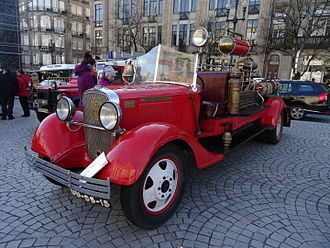 ^ "Formula 2 1950 – Angouleme". formula2.net. ^ "Results 1950 Formula 1 Grand Prix of Belgium". F1 Fansite. Retrieved 6 September 2017. ^ "Results 1950 Formula 1 Grand Prix of France". F1 Fansite. Retrieved 6 September 2017. ^ "1950 Nations GP". chicanef1.com. ^ a b "1950 Non-World Championship Formula One Races". silhouet.com. ^ a b "South American Formula Libre/Temporada Races 1946–1952". teamdan.com. ^ "Results 1950 Formula 1 Season". F1 Fansite. Retrieved 6 September 2017. ^ Allen Brown. "Bari, 9 Jul 1950 « Non-Championship F1 « OldRacingCars.com". oldracingcars.com. ^ "Formula 2 1950 – GP de Marseilles". formula2.net. ^ "Results 1951 Formula 1 Season". F1 Fansite. Retrieved 6 September 2017. ^ "Results 1951 Formula 1 Grand Prix of Switzerland". F1 Fansite. Retrieved 6 September 2017. ^ "Results 1951 Formula 1 Grand Prix of France". F1 Fansite. Retrieved 6 September 2017. ^ "V Gran Premio di Bari". www.statsf1.com. ^ "Results 1951 Formula 1 Grand Prix of Spain". F1 Fansite. Retrieved 6 September 2017. ^ "Results 1951 Formula 1 Grand Prix of Great Britain". F1 Fansite. Retrieved 6 September 2017. ^ "Results 1951 Formula 1 Grand Prix of Germany". F1 Fansite. Retrieved 6 September 2017. ^ "South American Formula Libre/Temporada Races 1946–1952". teamdan.com. ^ a b c d e f "South American Formula Libre/Temporada Races 1946–1952". teamdan.com. ^ "Carreras Año 1953 – Museo Fangio". museofangio.com. ^ "Results 1953 Formula 1 Grand Prix of Italy". F1 Fansite. 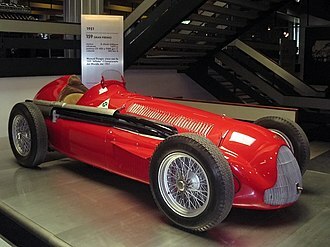 ^ "Formula 2 1953 – Modena GP". formula2.net. ^ "Results 1953 Formula 1 Season". F1 Fansite. ^ "Formula 2 1953 – Napoli GP". formula2.net. ^ "Results 1953 Formula 1 Grand Prix of France". F1 Fansite. ^ "1953 BRDC International Trophy". chicanef1.com. ^ "Results 1953 Formula 1 Grand Prix of Great Britain". F1 Fansite. ^ "Results 1953 Formula 1 Grand Prix of Germany". F1 Fansite. ^ "1953 Formula Libre Races". teamdan.com. ^ "Formula 2 1953 – Bordeaux GP". formula2.net. ^ "Results 1954 Formula 1 Season". F1 Fansite. ^ "Results 1954 Formula 1 Grand Prix of Argentina". F1 Fansite. ^ "Results 1954 Formula 1 Grand Prix of Belgium". F1 Fansite. ^ "Results 1954 Formula 1 Grand Prix of France". F1 Fansite. ^ "Results 1954 Formula 1 Grand Prix of Germany". F1 Fansite. ^ "Results 1954 Formula 1 Grand Prix of Switzerland". F1 Fansite. ^ "Results 1954 Formula 1 Grand Prix of Italy". F1 Fansite. ^ "Formula 1 1954 – GP von Berlin / Avusrennen, 19.09". formula2.net. ^ "Results 1954 Formula 1 Grand Prix of Spain". F1 Fansite. ^ "Results 1955 Formula 1 Season". F1 Fansite. ^ "Results 1955 Formula 1 Grand Prix of Argentina". F1 Fansite. ^ a b "Un tributo al chueco... Buenos Aires 1955". jmfangio.org. ^ "Results 1955 Formula 1 Grand Prix of Belgium". F1 Fansite. ^ "Results 1955 Formula 1 Grand Prix of Italy". F1 Fansite. ^ "Results 1956 Formula 1 Season". F1 Fansite. ^ "Results 1956 Formula 1 Grand Prix of Argentina". F1 Fansite. ^ "Sebring 12 Hours". racingsportscars.com. ^ "Results 1956 Formula 1 Grand Prix of Great Britain". F1 Fansite. ^ "Results 1956 Formula 1 Grand Prix of Germany". F1 Fansite. ^ "Results 1956 Formula 1 Grand Prix of Monaco". F1 Fansite. ^ "Nürburgring 1000 Kilometres". racingsportscars.com. ^ "Results 1956 Formula 1 Grand Prix of Italy". F1 Fansite. ^ "Results 1957 Formula 1 Season". F1 Fansite. ^ "Results 1957 Formula 1 Grand Prix of Argentina". F1 Fansite. ^ "Un tributo al chueco... Buenos Aires 1957". jmfangio.org. ^ "Gran Premio de Cuba". racingsportscars.com. ^ "Results 1957 Formula 1 Grand Prix of Monaco". F1 Fansite. ^ "Results 1957 Formula 1 Grand Prix of France". F1 Fansite. ^ "Results 1957 Formula 1 Grand Prix of Germany". F1 Fansite. ^ a b "Carreras Año 1957 – Museo Fangio". museofangio.com. ^ "Results 1957 Formula 1 Grand Prix of Pescara". F1 Fansite. ^ "Results 1957 Formula 1 Grand Prix of Italy". F1 Fansite. ^ a b "Un tributo al chueco... Buenos Aires 1958". jmfangio.org. ^ "Juan Manuel Fangio – Biography". MotorSportMagazine. Retrieved January 7, 2019. 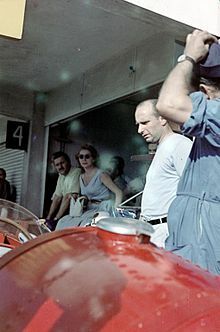 Wikimedia Commons has media related to Juan Manuel Fangio. Buenos Aires is the largest and most populous Argentinian province. It takes the name from the city of Buenos Aires, which used to be the capital until it was federalized in 1880. The current capital of the province is the city of La Plata, the entire province is part of the Pampas geographical region. The province has a population of about 15.6 million people, nearly 10 million people live in Greater Buenos Aires, the metropolitan area surrounding the Autonomous City of Buenos Aires. The area of the province,307,571 km2, makes it the largest in Argentina with around 11% of the total area. The inhabitants of the province before the 16th century advent of Spanish colonisation were aboriginal peoples such as the Charrúas and their culture was lost over the next 350 years. They were subjected to Eurasian plagues from which few survived, the survivors joined other tribes or have been mostly absorbed by Argentinas European ethnic majority. 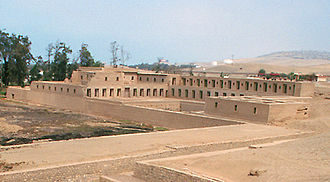 Pedro de Mendoza founded Santa María del Buen Ayre in 1536, even though the first contact with the aboriginals was peaceful, it soon became hostile. The city was evacuated in 1541, Juan de Garay re-founded the settlement in 1580 as Santísima Trinidad y Puerto Santa María de los Buenos Aires. Amidst ongoing conflict with the aboriginals, the cattle farms extended from Buenos Aires, jesuits unsuccessfully tried to peacefully assimilate the aboriginals into the European culture brought by the Spanish conquistadores. A certain balance was found at the end of the 18th century, the end to this situation came in 1879 with the Conquest of the Desert in which the aboriginals where almost completely exterminated. 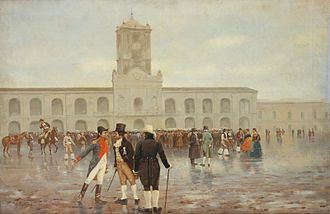 After the independence from Spain in 1816, the city and province of Buenos Aires became the focus of an intermittent Argentine Civil War with other provinces. 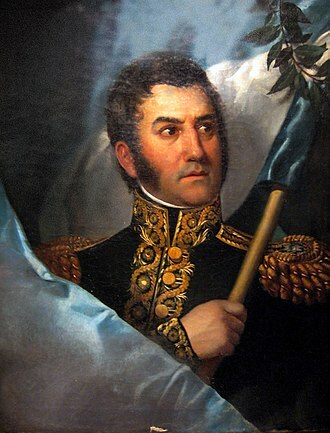 A Federal Pact secured by Governor Juan Manuel de Rosas in 1831 led to the establishment of the Argentine Confederation and to his gaining the sum of public power, which provided a tenuous unity. 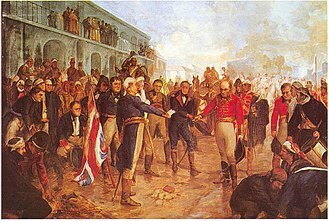 Ongoing disputes regarding the influence of Buenos Aires, between Federalists and Unitarians, and over the Port of Buenos Aires fueled periodic hostilities, the province was declared independent on September 11,1852, as the State of Buenos Aires. The 1956 Formula One season featured the tenth season of FIAs Formula One motor racing. It featured the seventh World Championship of Drivers as well as numerous non-championship races, the championship series commenced on 22 January 1956 and ended on 2 September after eight races. Juan Manuel Fangio won his third title, the fourth of his career. 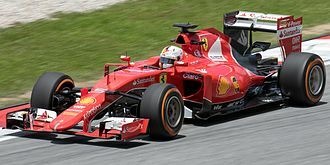 Until the 2006 season this was the last season during which no British constructor won any championship race, Fangio joined Ferrari after Mercedes-Benz, with whom he had won the 1954 and 1955 titles, withdrew from the sport. Ferrari acquired the folded Lancia teams D50 cars and put together a team containing Fangio, Eugenio Castellotti, Luigi Musso. Fangio won the race after commandeering Mussos car after his own car had broken down. Collins and Fangios team-mate at Mercedes, Stirling Moss – now driving for Maserati provided the biggest challenge to his title defence, in an open season the British Connaughts, Vanwalls and BRMs showed some signs of promise. Going into the race of the season, Fangio had an eight-point lead over Collins. The only way he could lose the title would be to no points with Collins winning and setting fastest lap. Fangio retired, and with Musso unwilling to share his car with Fangio, Collins, in a remarkable act of sportsmanship, instead chose to hand his car over to Fangio to allow the Argentine to finish second in the race and win his third title in a row. The following races counted towards the 1956 World Championship of Drivers, the following teams and drivers competed in the 1956 FIA World Championship. The above list does not include competitors in the 1956 Indianapolis 500, Championship points were awarded at each race on an 8–6–4–3–2 basis to the first five finishers, with an additional point awarded to the driver setting the fastest lap of the race. Points for shared drives were divided equally between the drivers, regardless of who had driven more laps, Only the best five round results were counted. Italics indicate fastest lap Bold indicates pole position † Position shared between more drivers of the same car Only the best 5 results counted towards the Championship, numbers without parentheses are Championship points, numbers in parentheses are total points scored. Chieti is a city and comune in Southern Italy,200 kilometres east by northeast of Rome. It is the capital of the province of Chieti in the Abruzzo region, Chieti lies on a crest along the Pescara River a few kilometres away from the Adriatic Sea, and with the Maiella and Gran Sasso mountains in the background. In Italian, the form is teatino and inhabitants of Chieti are called teatini. The English form of name is preserved in that of the Theatines. Chieti is amongst the most ancient of Italian cities, according to mythological legends, the city was founded in 1181 B. C. by the Homeric Greek hero Achilles and was named in honor of his mother, Thetis. As Theate Marrucinorum, Chieti was the town of the warlike Marrucini. According to Strabo, it was founded by the Arcadians as Thegeate, after the Marrucini were defeated by the Romans, they became loyal allies of the more powerful forces. Their territory was placed under Roman municipal jurisdiction after the Social War, in imperial times, Chietis population reached 60,000 inhabitants but, after the fall of the Western Roman Empire, it was destroyed by Visigoths and Heruli. Later it was seat of a gastaldate under the Lombard kings, after its destruction by Peppin, it became a fief of the Duchy of Benevento. 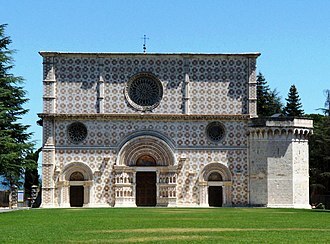 Chieti recovered some political and economic importance under the Norman rule of Southern Italy, after a cultural and architectural flourishing during the 17th century, under the aegis of the Counter-Reformation, Chieti was decimated by fatalities from plague in 1656. In the 18th century, several new academies and schools were developed here, in 1806 Chieti was turned into a fortress by Napoleons France. In 1860 it became part of the newly created Kingdom of Italy, during World War II, Chieti was declared an open city and was not bombed by either side. It was the site of an infamous POW Camp for British, the city at this time welcomed many refugees from the near towns and villages. Allied forces liberated the city on June 9,1944, one day after the Germans left the city, the Gothic Cathedral, re-built by bishop Attone I in 1069. Of that building only parts of the Romanesque crypt remain, the church was remade in the 14th century and the bell tower was enlarged. Turismo Carretera is a popular touring car racing series in Argentina, and the oldest car racing series still active in the world. The first TC competition took place in 1937 with 12 races, future Formula One star Juan Manuel Fangio won the 1940 and 1941 editions of the TC. It was during this time that the series Chevrolet-Ford rivalry began, until the 1960s the races were held on temporarily closed roads, hence the series name. These improvised circuits would often present a combination of dirt and asphalt surfaces unlike those of dedicated race tracks, during the 1960s the category began employing high-end technologies, with local manufacturers investing heavily for prestige. The Ford Motor Company of Argentina and Chevrolet were main contenders, the European marque Renault, which had merged with Industrias Kaiser Argentina and thus inherited the Rambler range, was a contender. In the 1970s, the Sport Prototipo category was spun off TC to allow TC to return to its roots which made it immensely popular with small-town audiences. The 1954 Formula One season was eighth season of FIA Formula One motor racing. It featured the 1954 World Championship of Drivers and a number of non-championship races, the World Championship of Drivers was contested over a nine race series which commenced on 17 January and ended on 24 October 1954. The championship was won by Juan Manuel Fangio who drove, and won races, argentine drivers gained the first two positions in the championship with José Froilán González placing second to his compatriot Fangio. 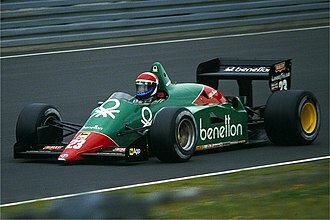 With Formula One changing to 2, fangios French success had come after switching from the Maserati team with whom he had won the first two Grands Prix of the season. Reigning champion Alberto Ascari had a successful switch of teams. Unfortunately for him, Lancias car, the D50, was not ready until the final World Championship race, Championship points were awarded for first five places in each race on an 8,6,4,3,2 basis with 1 point awarded for the fastest lap. Only the best five of nine scores counted towards the championship, points for shared drives were divided equally between the drivers, regardless of who had driven more laps unless one of the drivers was deemed to have completed insufficient distance. 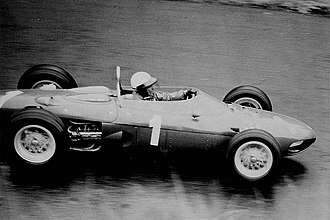 Drivers who shared more than one car during a race received points only for their highest finish, argentine Onofre Marimon was killed during practice for the German Grand Prix driving a Maserati 250F. It was the first fatality at a championship Formula One race weekend, the following races counted towards the 1954 World Championship of Drivers. 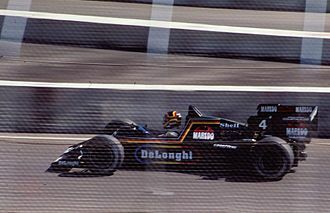 All championship races were open to cars complying with FIA Formula One regulations with the exception of the Indianapolis 500 which was for cars complying with AAA National Championship regulations. The Dutch Grand Prix was originally supposed to be held at Zandvoort but there was no money for the race to be held, the German Grand Prix was given the honorary title of being the European Grand Prix of 1954. The following teams and drivers competed in the 1954 FIA World Championship of Drivers, italics indicate fastest lap Bold indicates pole position † Position shared between multiple drivers of the same car ‡ Several cars were shared in this race. See the race page for details, only the best 5 results counted towards the Championship. From the top, left to right: city skyline, Torre Tanque, fishing boats in the port, Saint Michael chalet, Castagnino Museum, Sea Lion Monument, Torreón del Monje, the Mar del Plata Cathedral, and a panoramic view from Edén Palace featuring the Casino Central and the NH Gran Hotel Provincial. La Falda and the Córdoba Sierras foothills. Known nationally for its rich agriculture and industries such as motor vehicles and food processing, Córdoba also enjoys a vigorous services sector. Take-off classification for the First Round Nueve de Julio city circuit (1959).